Home | Serigraphs and Giclee Fine Art | Liudmila Kondakova Parisian Art | Liudmila Kondakova Limited Edition Serigraph on White Paper: "Folie's Cafe"
Liudmila Kondakova Limited Edition Serigraph on White Paper: "Folie's Cafe"
Edition Size: Limited; Signed in pencil and numbered with COA. Size: paper size: 41 x 29 inches, image size: 36 x 24 inches. 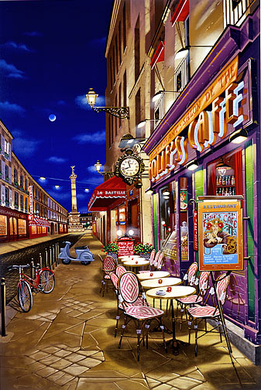 Home | Fine Art Prints & Limited Editions | Gallery Direct Art is your Authorized Chalk & Vermilion Dealer | Liudmila Kondakova Parisian Art | Liudmila Kondakova Limited Edition Serigraph on White Paper: "Folie's Cafe"